Visitor guide to the East Coast of Kintyre in Argyll has information on the place, also accommodation and hotels in East Coast, sightseeing, sleeping and eating in Kintyre. We also include some information about the nearby towns such as Arran and Carradale. The slow and winding single track B842 meanders up the east coast from Campbeltown to Skipness and Claonaig, departure point for the ferry to Arran. The scenery en route is gentle and pleasant, with nice views of Arran, and there are some worthwhile places to stop, but public transport is somewhat limited. Ten miles up the coast are the idyllic ruins of Saddell Abbey, a Cistercian establishment founded by Somerled in 1160. 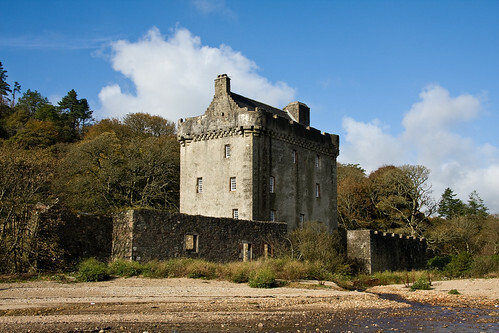 The abbey fell into ruin in the early 16th century and much of the stone was used in the building of Saddell Castle for the Bishop of Argyll. Though little remains, there are some impressive medieval grave slabs, depicting knights, monks, ships, animals and other images. A few miles further north is the village of Carradale, the only place of any size on the east coast, nestling in the sandy sweep of beautiful Carradale Bay. There are several pleasant marked walks through the woods between the B842 and the shore. The shortest of these walks (with green waymarkers) starts from the Network Centre and is a mile long. There's a three-mile walk with red waymarkers which starts at the Port Na Storm car park and follows the forest road to the left. After 150 yds the route turns left again at the road junction. A mile further on, you turn right off the road and follow the track up to the summit of Cnoc-nan Gabhor, from where there are great views of Kintyre and across to Arran. A third walk (six miles; blue waymarkers) also starts from the Port Na Storm car park. This time the route heads right at the junction 150 yds beyond the car park and then runs north along the shore, with a chance of seeing dolphins and basking shark. The path then swings west towards the road, then turns south with views of Carradale Glen. If the weather's bad, there's the Network Carradale Heritage Centre, which features displays of fishing, farming and forestry. Easter to mid-Oct Mon-Sat 1030-1700, Sun 1230-1600. A little further north is the Grogport Tannery, which produces organically tanned, naturally coloured sheepskins. Daily 0900-1800. Twelve miles north of Carradale the B842 ends at Claonaig, which is actually nothing more than a slipway for the ferry to Arran. From here the B8001 heads west to meet the A83 near the Kennacraig ferry pier. A dead-end road runs north for a few miles to the tiny village of Skipness, where you can visit the substantial ruins of the 13th-century Skipness Castle and nearby chapel. You might want to stop here and enjoy some fresh seafood or good home baking at the Seafood Cabin, Tel. 01880-760207, open daily 1100-1800 from end May-end September. There are also several B&Bs and a campsite at Carradale Bay, with full facilities, Tel. 431665; open Easter-Sep.